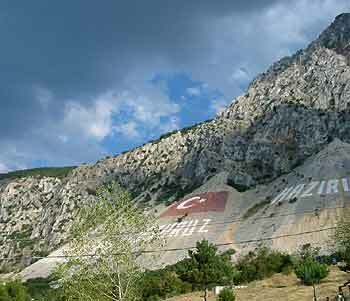 As we approached the lake, I tried to take a photo of a hillside that had a huge Turkish flag painted on the side of it. At every attempt, something seemed to get in the way, be it a tree or a building. As we got nearer, Neil explained that the lake was home to a commando regiment of the Turkish military. As I was still holding the camera to the window trying to get a photo of the hillside, Neil reminded us of the danger of photographing military establishments, referring to the recent prison sentences of the plane spotters in Greece. Manda tried suggesting more suitable vantage points to get the photo, even as we were driving past guard posts with guards in. With guns. I chose not to risk a scene. I was happy - I'd got one half decent shot! While we drove around the lake side, the microphone on the bus began cutting out on Neil - as it had done numerous times on the trip - and Safet tried to show that it was working fine (as had also done numerous times). Whenever it failed for Neil, it worked perfectly for Safet. On this day, Safet decided to sing for us - with no sound cutting out - thus proving that the microphone was fine and Neil must be a complete fool, or something like that. He finished his little Turkish rendition with the first English words I'd heard him say so far: "What? No problem." Needless to say, we were all in stitches! He then continued with a second verse as we drove up the peninsular, finishing this time with a "Thank you" and a round of applause from everyone. All this humour was in complete contrast to the surroundings we were in. While it was a beautiful location, there was nobody sitting at any of the lake-side restaurants. All the cafes were empty. Neil explained that Egirdir was very much a locals holiday destination, and that with the souring inflation rates and static salaries, a lot of Turkish people had simply stopped coming. There was also very little through traffic, due to its geographical location. While Explore use it as a stop-over between the long distance between Pamukkale and Ürgüp, many others instead choose Konya. In fact, Explore was now the only tour bus passing through - that's a maximum of 20 people for just one night every two weeks. This was certainly not enough to keep things ticking over, but the restaurateurs sat outside in hope nonetheless, hoping for whatever custom they could get. The policy in such circumstances is to chop and change. Sometimes, the whole group would eat in the hotel restaurant, at other times they would eat as a group at another restaurant (a different one each time), while at other times it would be individuals' choice. It's the only fair way to spread the meagre spending around the town. Manda and I set out to get something to eat, and looked briefly at the menu of the Derya restaurant, which is almost directly opposite the Hotel Egirdir. Immediately, the owner bounded out towards us - and this is no exaggeration of his enthusiasm. He encouraged us to come inside to take a look, showing us the starters in the display cabinet - the lights for which were only switched on for us. He also took us in to the kitchen and showed us the starter, still in the pan. It was very hard to walk away, and so we ate there. He was lucky - any of the restaurants further from our hotel would be finding it much more difficult. As we walked to our table, the display cabinet lights were once again switched off. I noticed also that the kitchen was also in almost complete darkness, and this was to be the theme for the rest of the night - nothing essential was left switched on for very long. The owner/manager offered to take a picture of us. I handed the camera over but switched off the digital display first. Was I following their lead? No, I just thought it was a bit too flash and did not want to appear ostentatious. Afterwards, we walked into town to discover that very little was actually open. It was barely past 9 o'clock but only corner shops and such like were open. Everyone else had evidently given up any hope of making money - or even breaking even - for the day. The saddest thing is that 5 years ago, all the restaurants would have been busy, often requiring pre-booking, according to Safet. Back at the hotel - where the lights were on and drinks were available - we finished off the day with a couple of bottles of Efes with Neil and Salih, one of the locals. Salih appeared to be taking something of an interest in one of our group, Elina, who in turn appeared to have drunk perhaps a malibu or two too many. Getting leathered with someone who owns a leather shop, how appropriate. 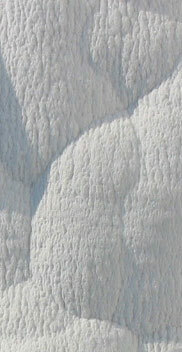 The ultra-bright natural lime rock formations at Pamukkale.